If our historical and visual memories are filled with Cubists and Futurists, then we generally have only but a vague idea what their English equivalents, the Vorticists, wanted. An exhibition at the Peggy Guggenheim in Venice (until May 15, then at the Tate Britain from June until September) will repair this neglect. This was a fluctuating group, under the aegis of Ezra Pound. And in great opposition to the elegant bourgeoisie of Bloomsbury : the Vorticistes, were political, popular, tough guys. 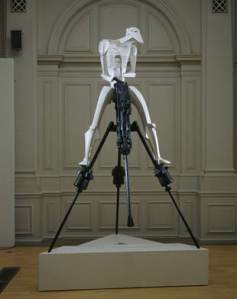 From the very first room, all is revealed: Jacob Epstein’s Rock Drill (1913-1915, reconstructed in 1973): a white man on a black drill / submachine gun, is an aggressive, violent sculpture where the combination of metallic forms of the head, thorax and the immense black spider legs of its device evoke horror, destruction and the evil power of mankind. It’s a hero-worker before Stakhanov, yet it is also a combatant. We are at the eve of war; a little later, Epstein does a retake of this bust in bronze thence amputated, mutilated and with a severed arm. So many sculptures. 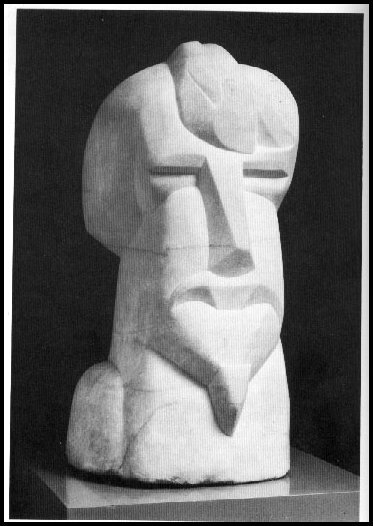 The Frenchman Henri Gaudier-Breszka (whose work the Pompidou Centre recently exhibited), an anarchist fellow traveler who died on the battlefront in 1915, had sculpted the hieratic head of Ezra Pound in 1914 in Pentelic marble dull like light wood. It’s almost an idol from Easter Island, in front of which we can bow down, the master of thought, the master of dreams. He died in exile, banished, a stone’s throw away, in Venice, precisely. All the vocabulary of the Vorticists is full of words that speak of revolution and marginality. Their magazine was named Blast, they founded the Rebel Art Club, they saw themselves as apaches, as outlaws. 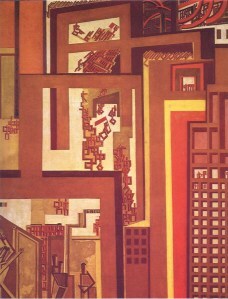 A painting by Wyndham Lewis titled The Crowd (1915-1915), abstract looking, shows a multitude of anthropomorphic red cascading ideograms encroaching in an ensemble of lines, doors and windows evocative of Metropolis or The Modern Times. Facing these proletariats (? ), several supermen at the bottom of the painting attempt to close the doors to block entry from the prostesters; we can visibly read on one of the sign panels the letters ENCL (enclave? enclosed?). It’s a graphic painting that is very typical of the Vorticistes- angular, geometric, mechanical, harsh, and also a very political painting. We can also note the graphic design of the review publication Blast, Dorothy Shakespear’s collages (the future Mrs Pound), Edward Wadsworth’s xylographs, Helen Saunders’ geometric and abstract compositions, and the décor of Frida Strindberg’s Cabaret du Veau d’Or, in which all would participate. But of course, what seduced me were the first abstractions in the history of photography in 1916. 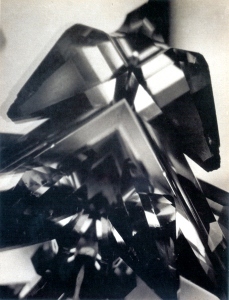 The vortographes of Alvin Langdon Coburn, were created by placing three mirrors joined from corner to corner (a vortoscope) in front of the camera’s objective to achieve a kaleidoscopic effect whilst photographing pebbles and bits of glass. 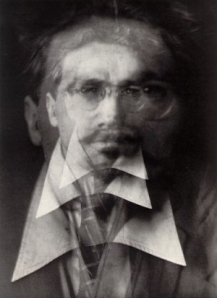 After having created some photographic portraits of Pound with doubles and blurs, Coburn constructed his Vortoscope and was the first to deviate from representing reality and concentrate entirely on abstract forms. But Pound wasn’t very impressed; for him, it was just an ‘art of the eye, not an art for the hand and eye.’ Coburn created only forty odd Vortographs, then stopped photographing altogether in order to concentrate on Esotericism. The group of Vorticists hardly lasted longer and dissolved in 1920. Their impact was not major, compared to Futurism (more viril, more war-prone) and Cubism (more formal, less representational), but this exhibition is a wonderful occasion to get to know them a little better.